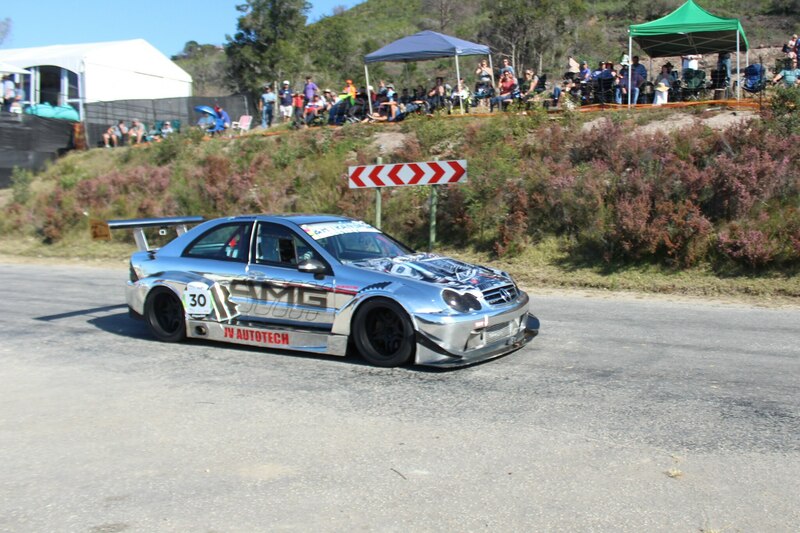 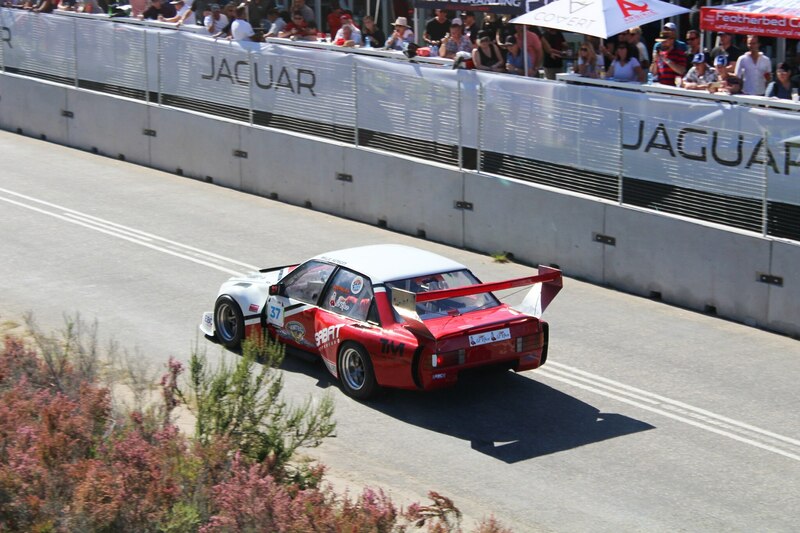 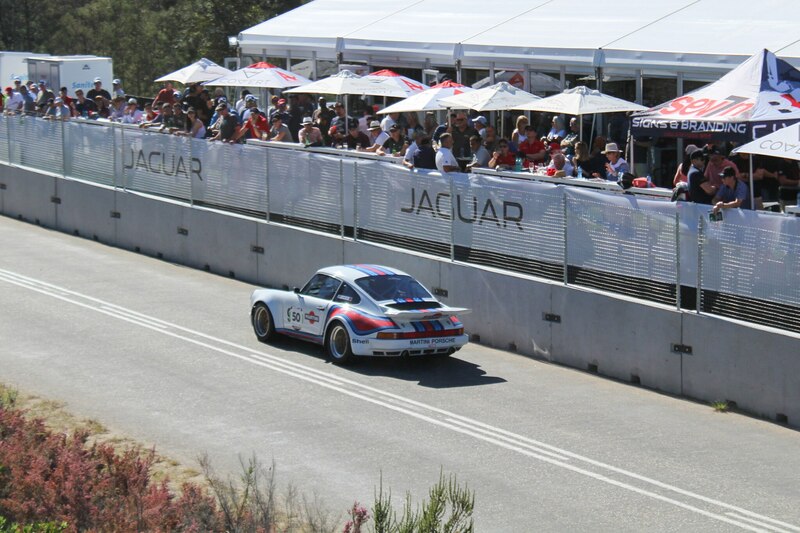 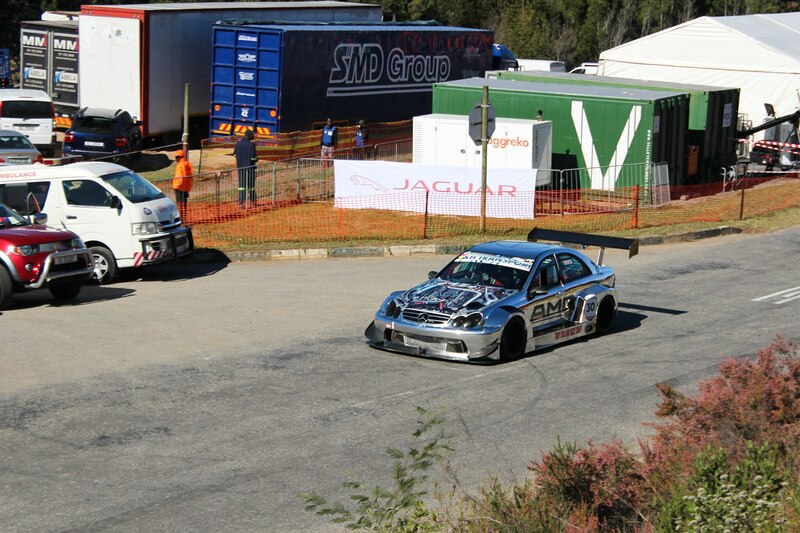 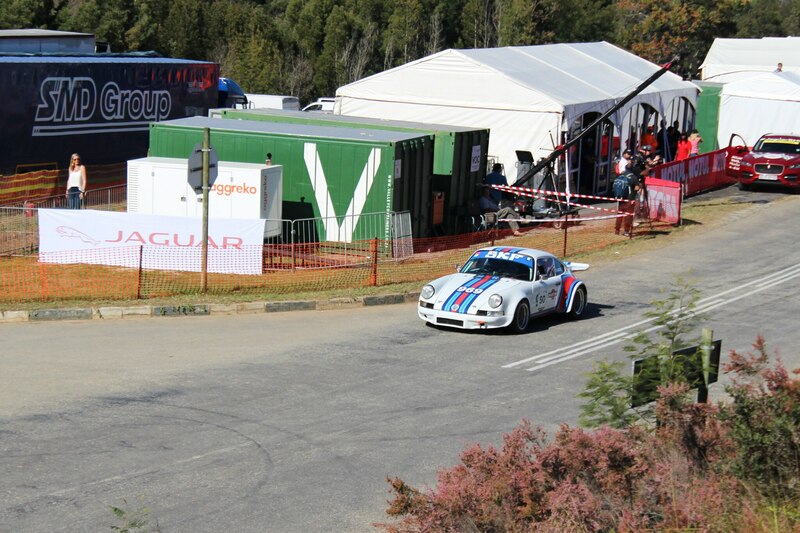 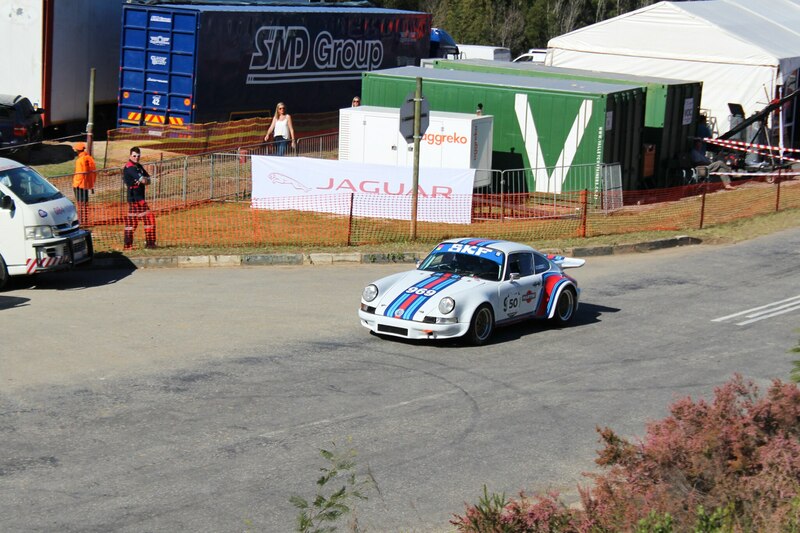 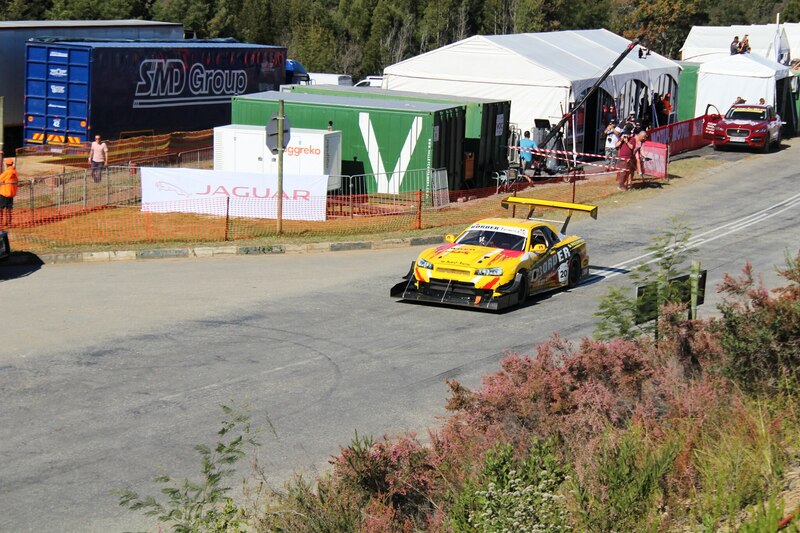 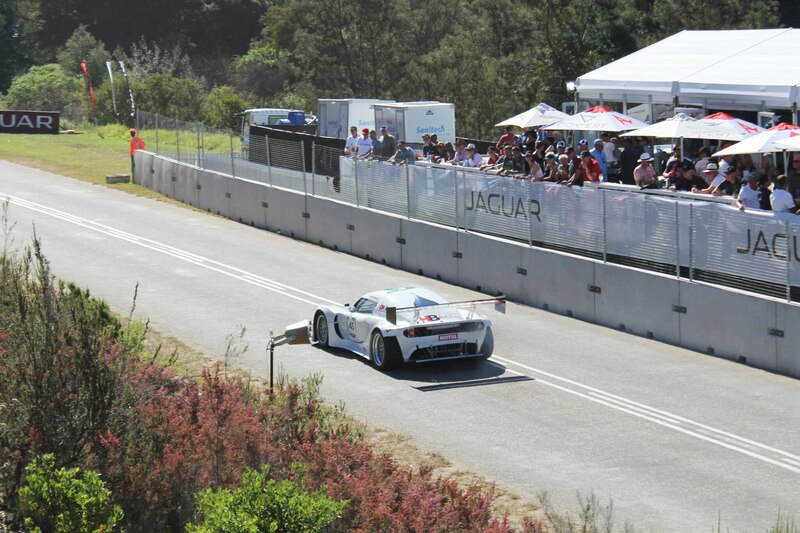 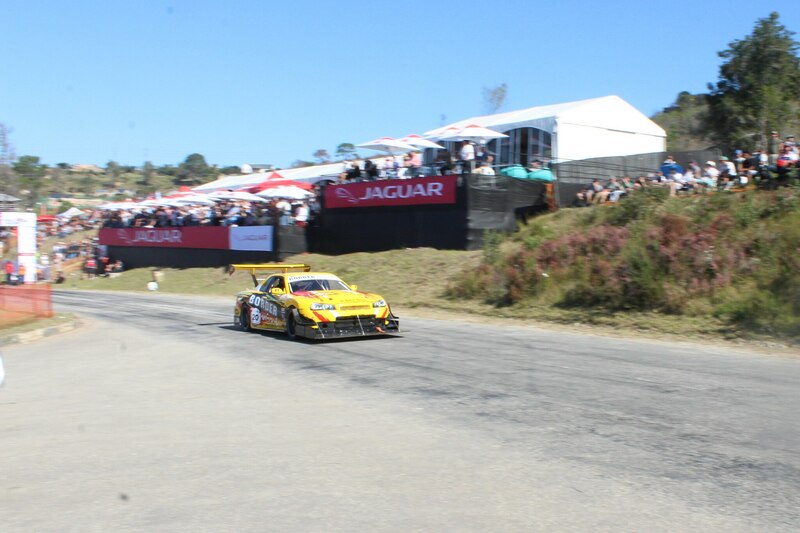 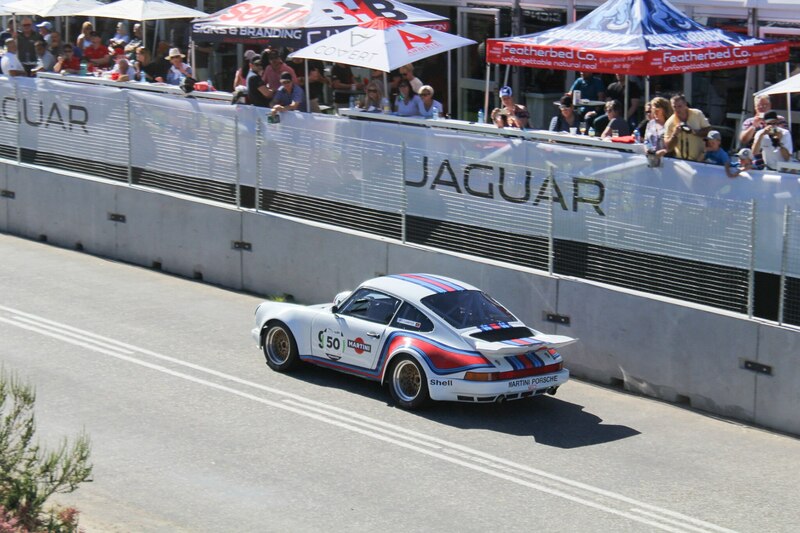 KNYSNA, South Africa — While Friday at the 2018 Jaguar Simola Hillclimb was reserved for the classics, the King of the Hill main event was reserved for almost anything. 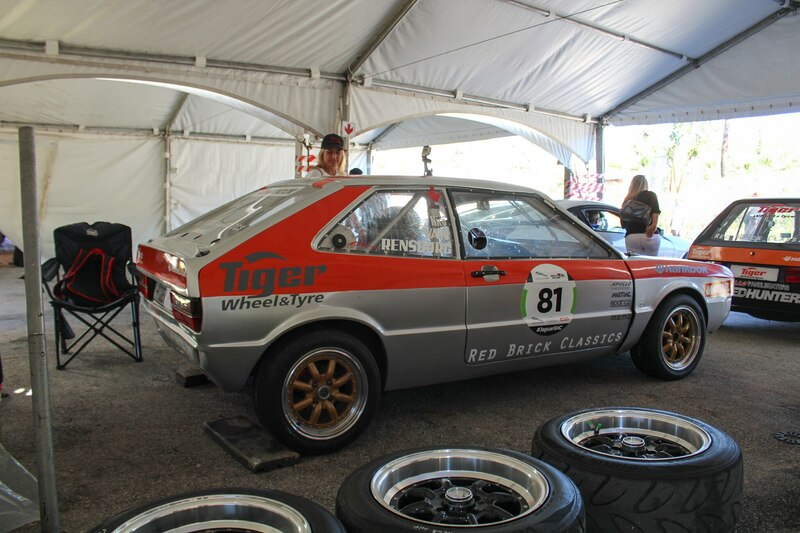 Entries were divided into three groups—stock cars, modified street cars, and purpose-built racers—and 19 classes. 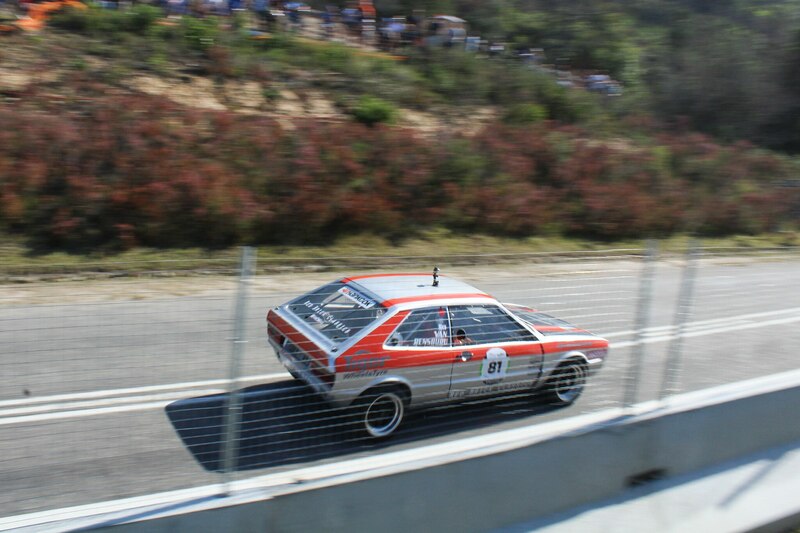 In all, 84 cars were entered with the top ten in each group competing for supremacy in a single-run shootout. 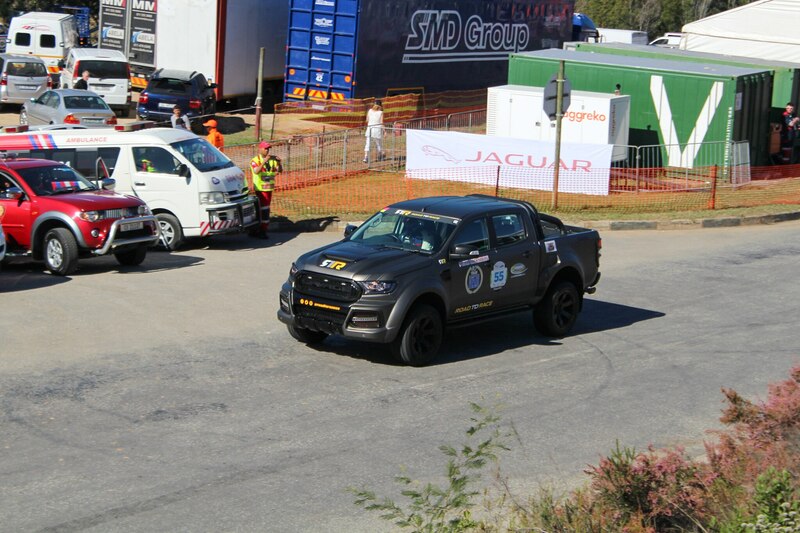 You can see the complete results here. 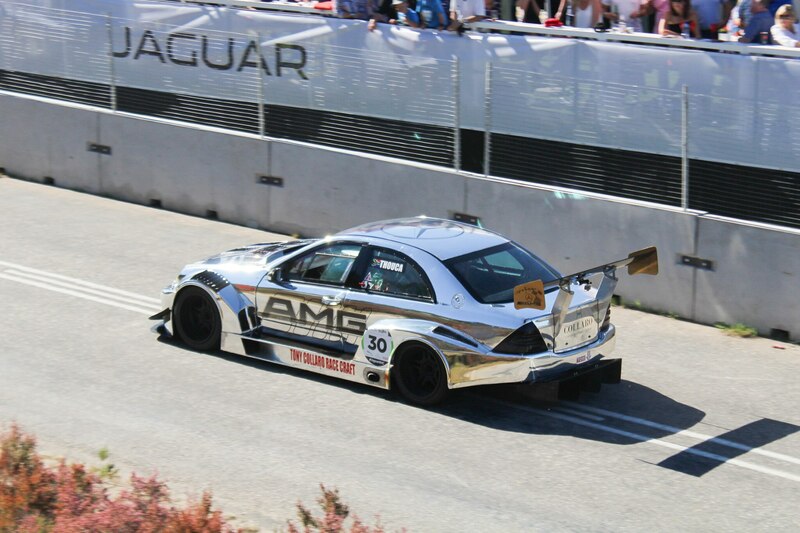 If there was a “Most Unique Car” award to be handed out, it would almost certainly be snagged by Thouca Mechanicos’ custom 2004 Mercedes-Benz C55 AMG. 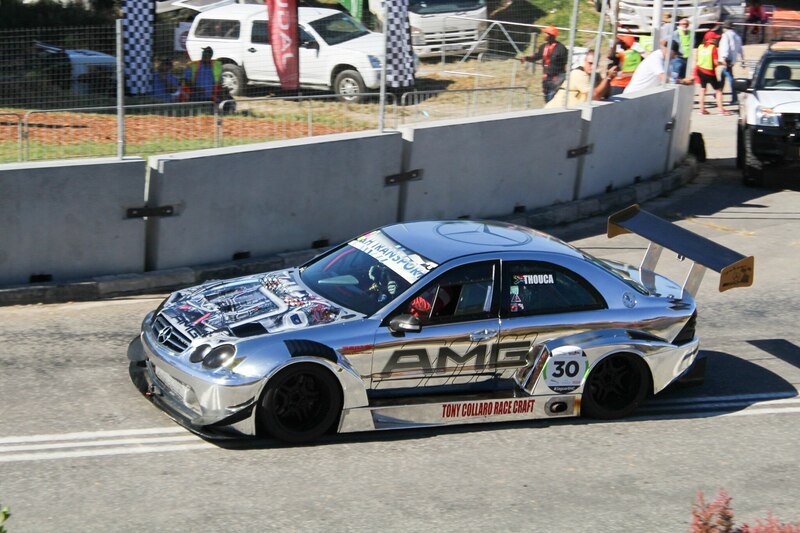 While its not entirely certain how much of the original car remains underneath the chrome DTM-inspired bodywork—and the same goes for the internals its 5.5-liter V-8—the lone standard-bearer for the three-pointed star at the 2018 King of the Hill certainly drew plenty of attention from the crowd. 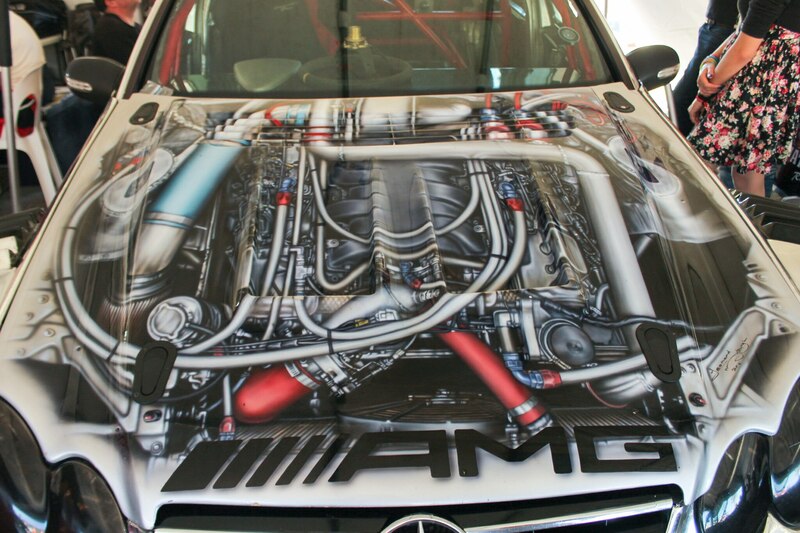 The wildest detail about the car—and perhaps most ridiculous, depending on your point of view—is the hood, which has been airbrushed to mimic the appearance of its engine bay. 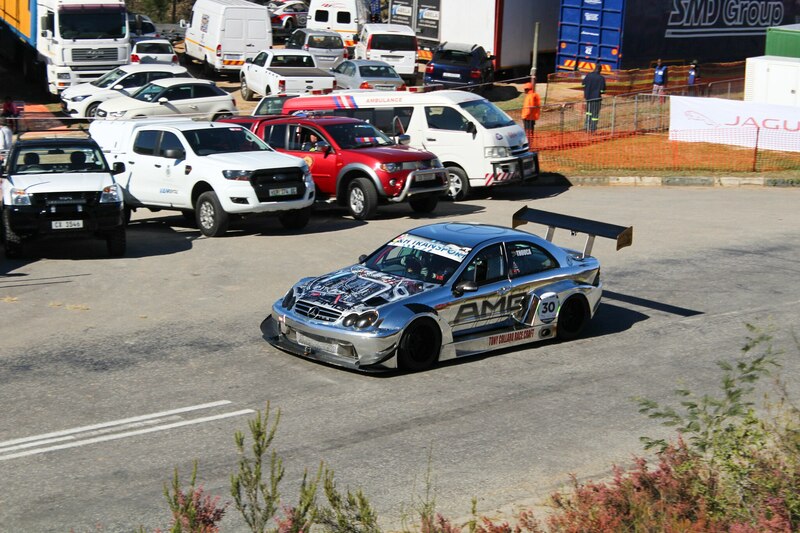 Regardless of how you feel about the idea, the artwork itself is quite well executed. 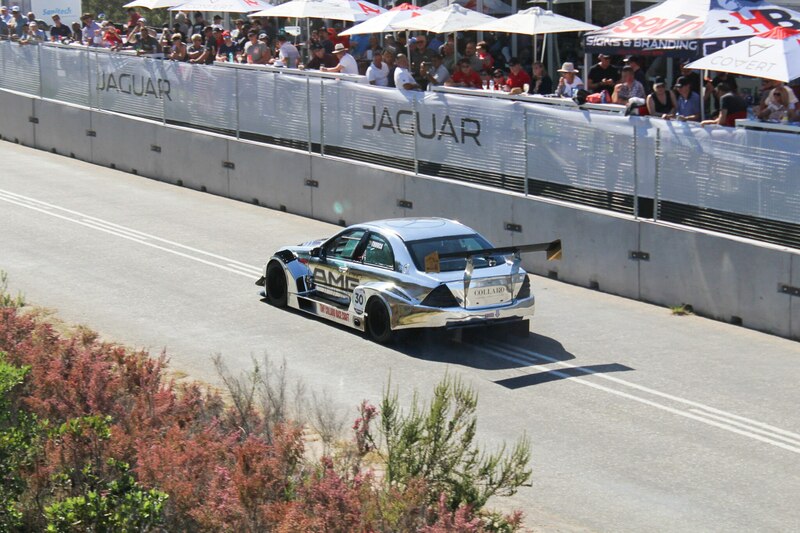 Mechanicos finished with a best time of 44.644 seconds. 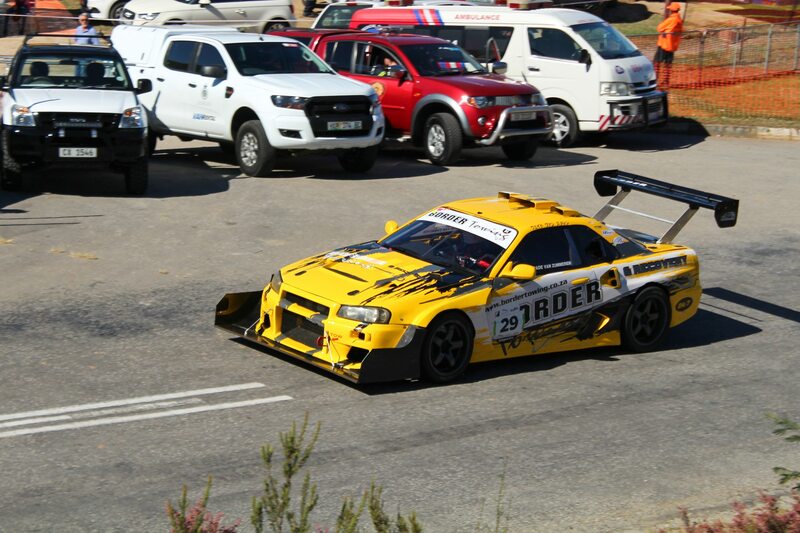 If Martin or Wade Van Zummeren’s R34 Skyline drove past your mom’s house, she’d be picking up the phone to call 911 and report that shots were fired. 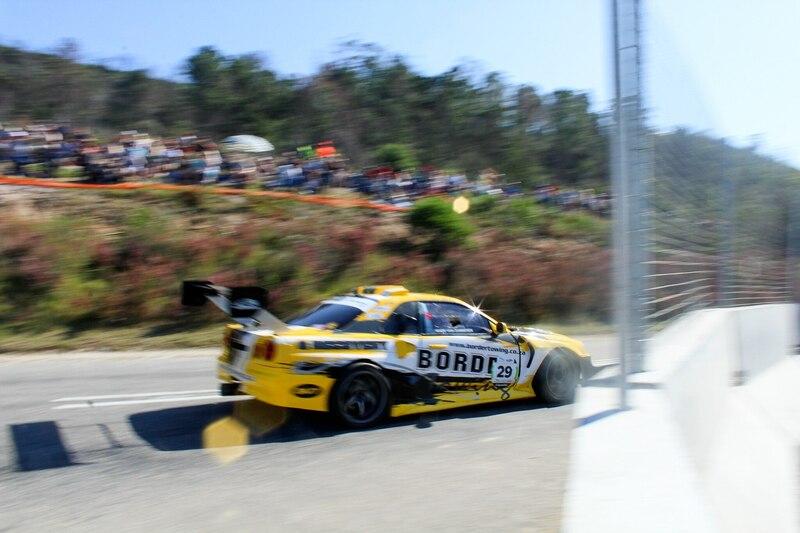 That’s because every time one of the two yellow Nissan R34s roared up the Hillclimb course, the exhaust note was accompanied by loud backfires that could easily be mistaken for a .45-caliber handgun if not a .308-caliber rifle. 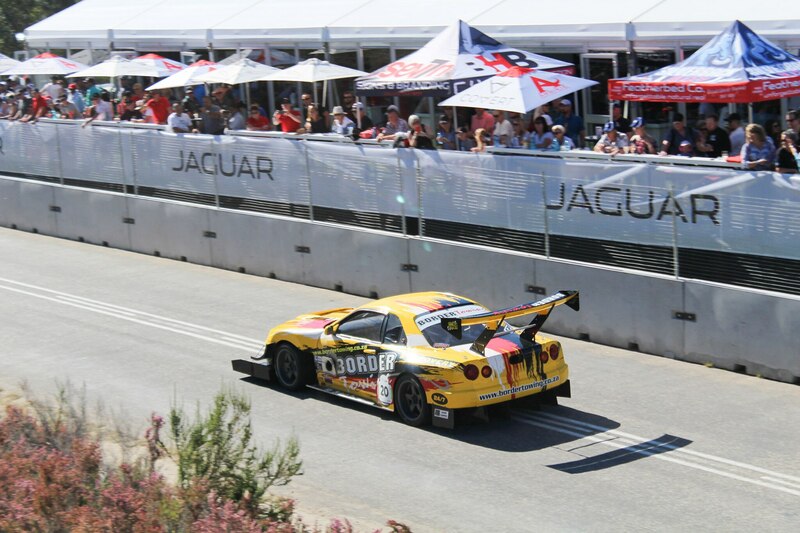 Martin’s #20 car was by the R34 Skyline GT-R’s original 2.6-liter twin-turbo I-6, while Wade’s #29 was powered by a twin-turbo V-6 taken from an R35 GT-R and sized up to 4.2 liters. 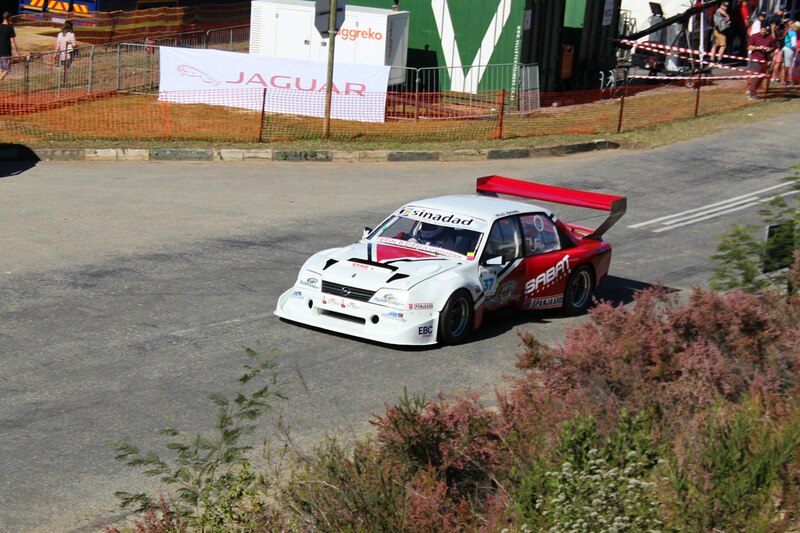 Martin finished fourth in the Modified Shootout with a time of 40.417 seconds. 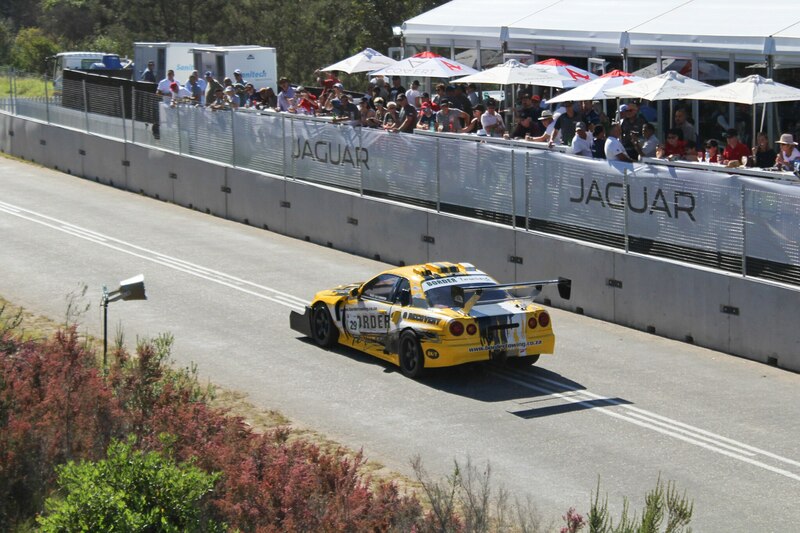 Wade’s best time was 43.342 seconds, but the car was unable to finish the day and only ran half of the qualifying rounds. 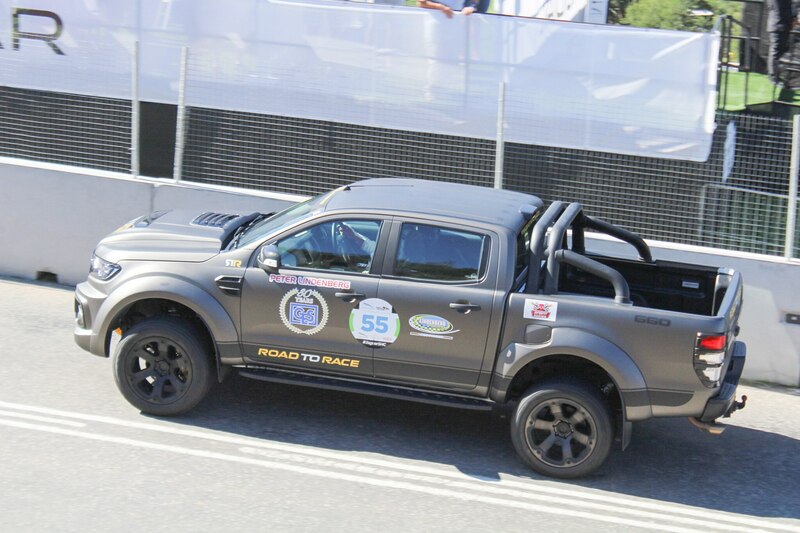 South Africans seem to love pickup trucks, which they call “bakkies,” almost as much as we do. 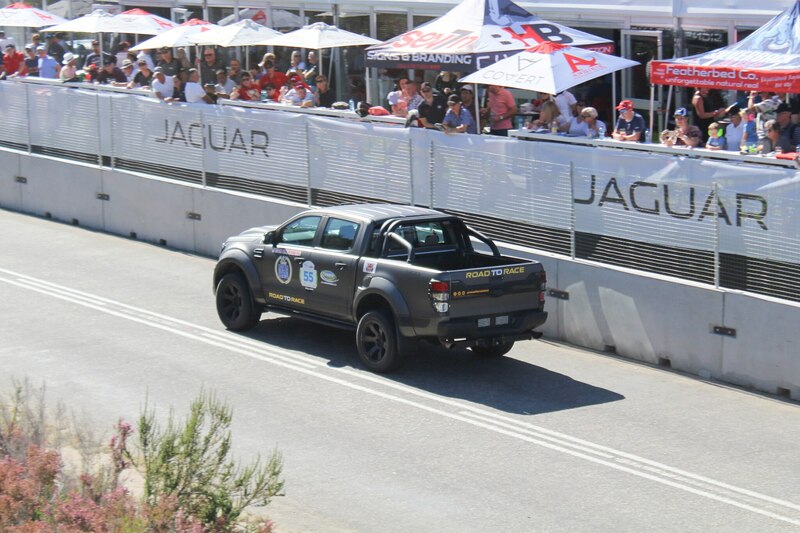 From what I could tell after spending almost a week driving up and down its southwest coast, you can’t throw a rock anywhere in the country without hitting one, which will probably be a Toyota Hilux or a Ford Ranger, so it wasn’t surprising to see one of the latter entered in the Hillclimb. 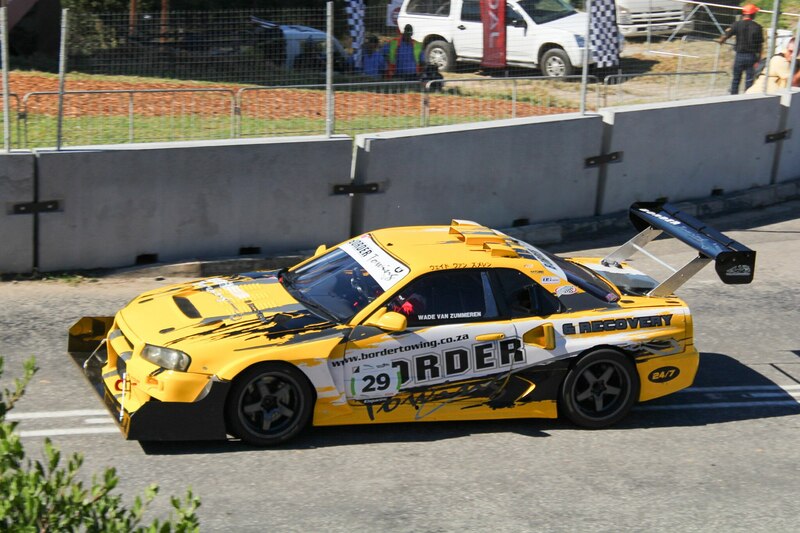 Peter Lindenberg’s 2016 Ranger is a performance variant built by South African tuner Road to Race. 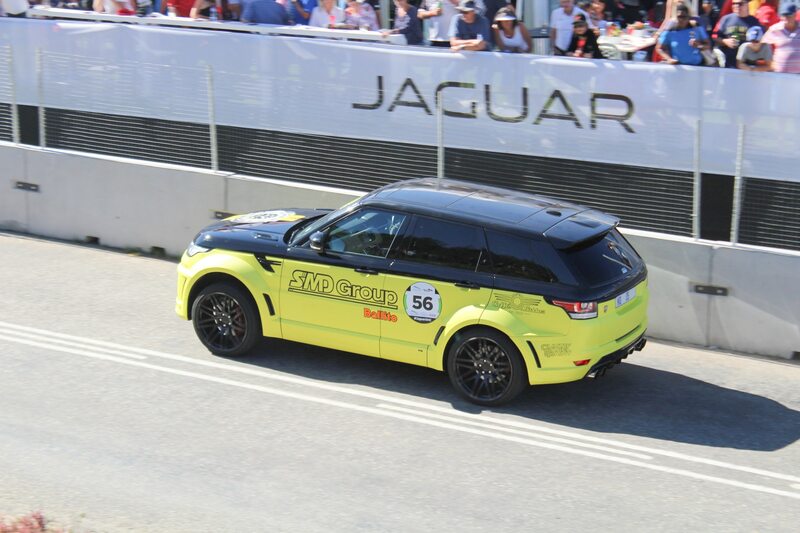 Dubbed the Savage 660, it’s powered by a supercharged Coyote 5.0-liter V-8 that makes 684 hp that’s sent through a Tremec Magnum T6 transmission. 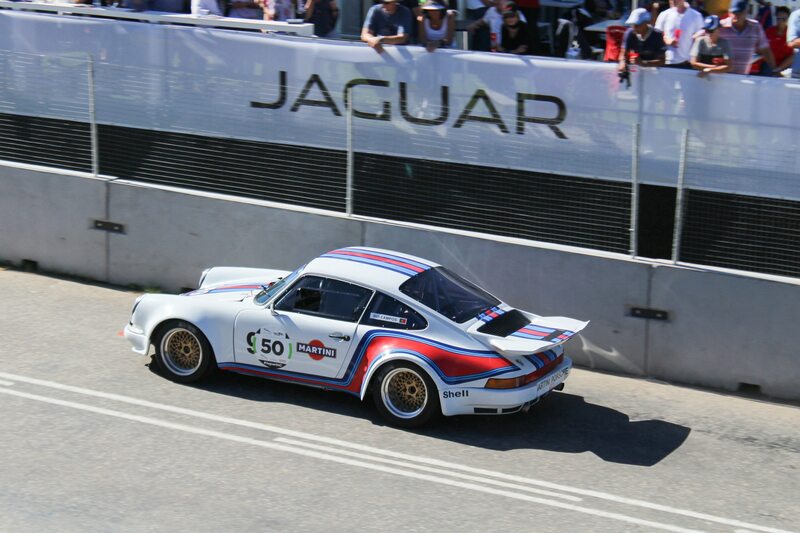 Oh and the matte-gray scheme is actually a wrap, as a closer look revealed hints of the original white paint. 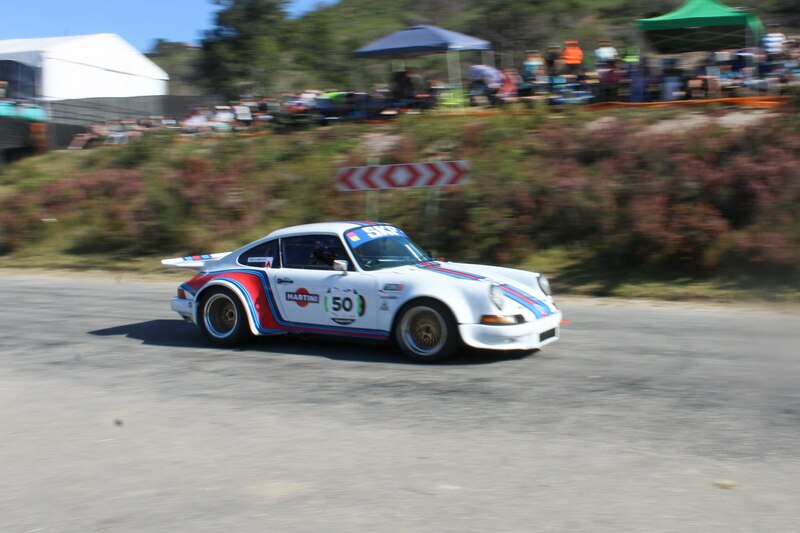 It’s best time was 51.715 seconds. 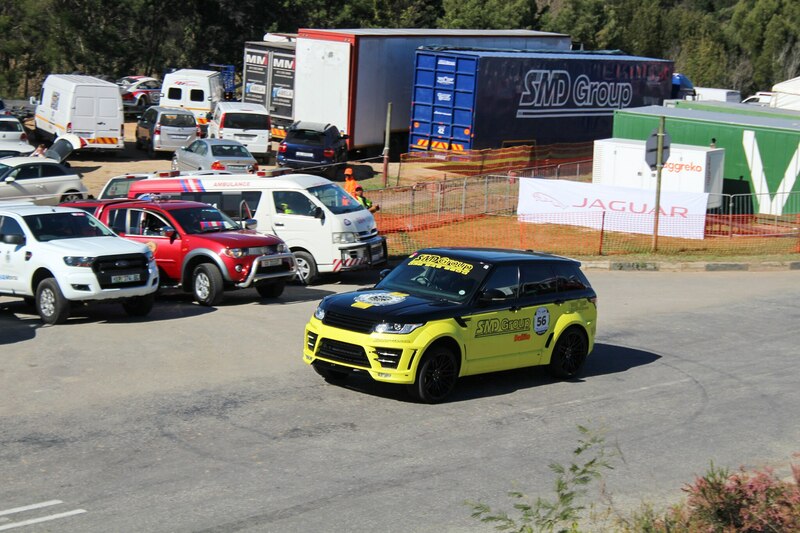 While South Africans seem to be almost as fond of Land Rover Defenders as they are of bakkies, the absurdity of the idea of racing one in the Hillclimb should be quite obvious. 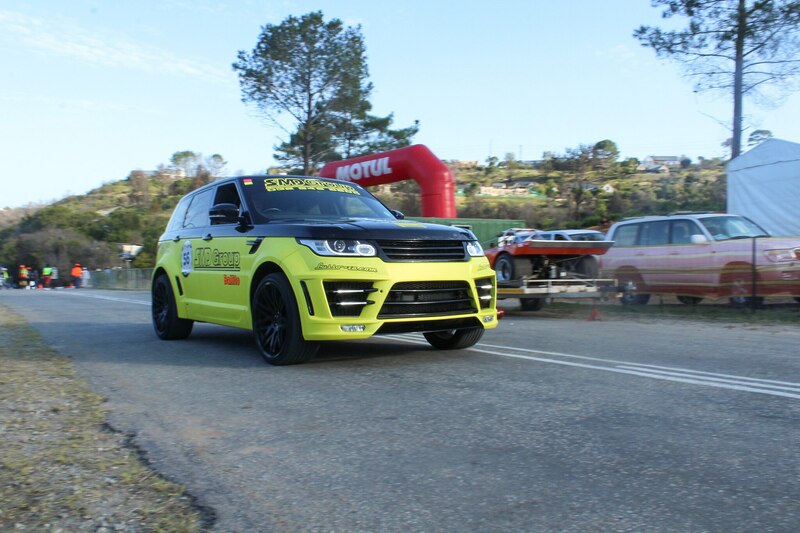 Instead, the one Land Rover entered was Jason Evan’s yellow-and-black 2015 Lumma CLR RS, a Range Rover Sport Supercharged worked over by German tuner Lumma Designs. 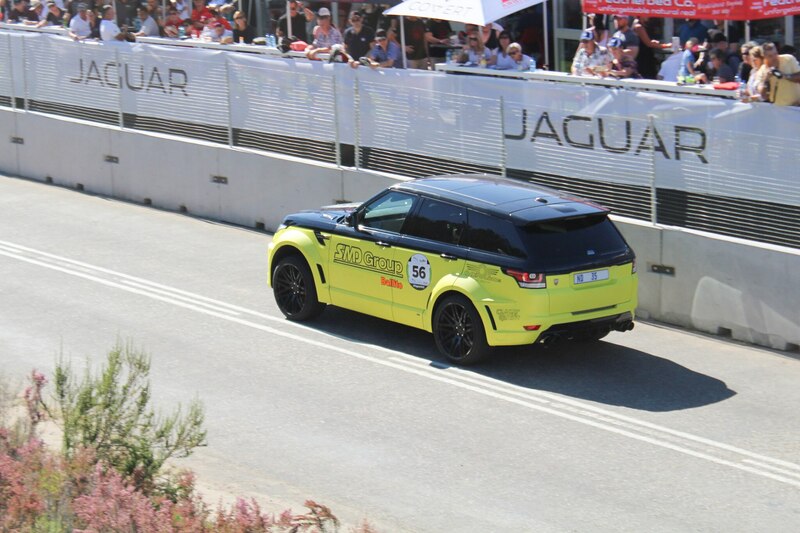 The yellow-and-black SUV was impossible to miss every time it got the lineup and completed its best run up the hill in 49.056 seconds. 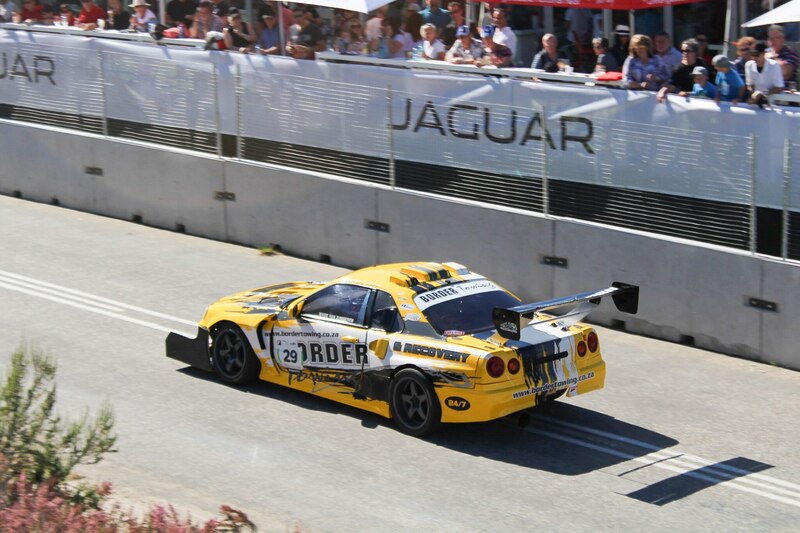 The Noble M400 is one of the finest track weapons to come directly from South Africa, so the presence of at least one was almost as obligatory as the presence of a Ferrari (represented by a 458 Italia and a 488 GTB). 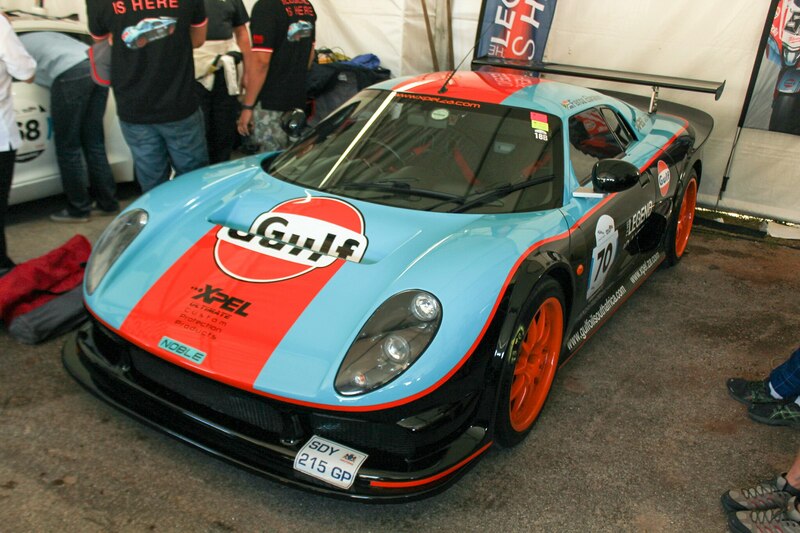 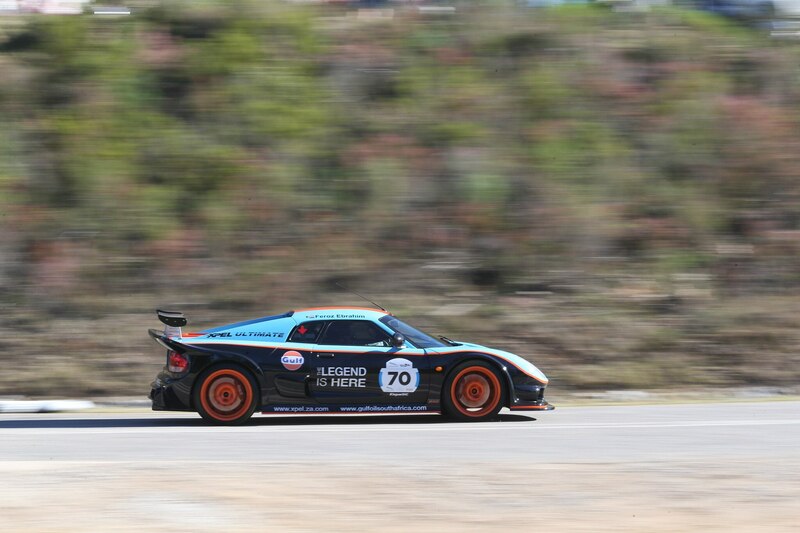 Here, that duty was carried out by Feroz Ebrahim’s Gulf-liveried example, which is powered by a 3.0-liter Ford V-6. 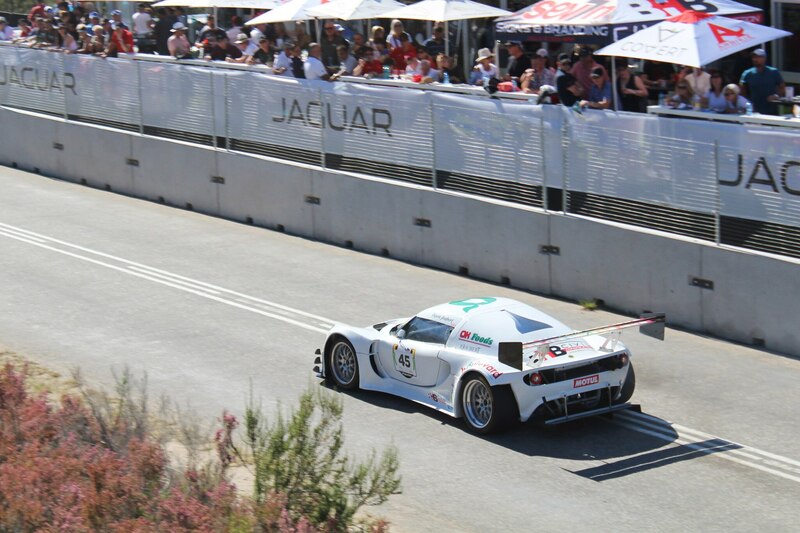 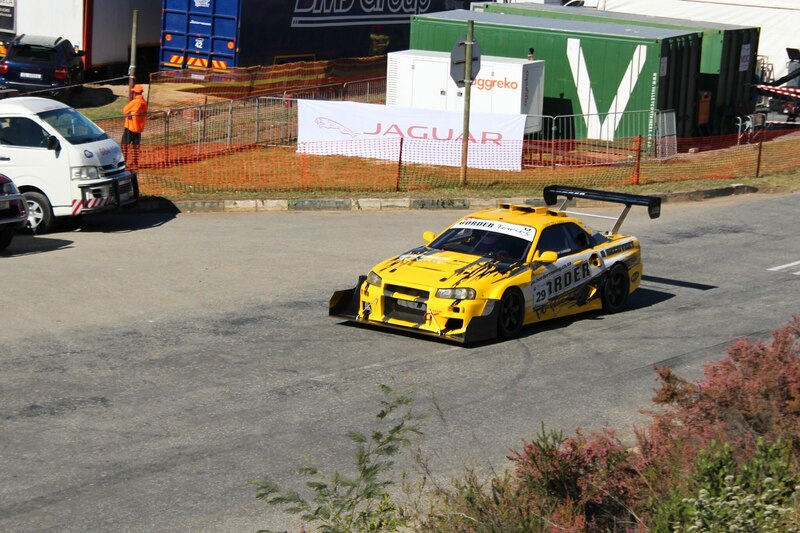 He finished seventh in the Road and Supercar Shootout with a time of 46.966 seconds. 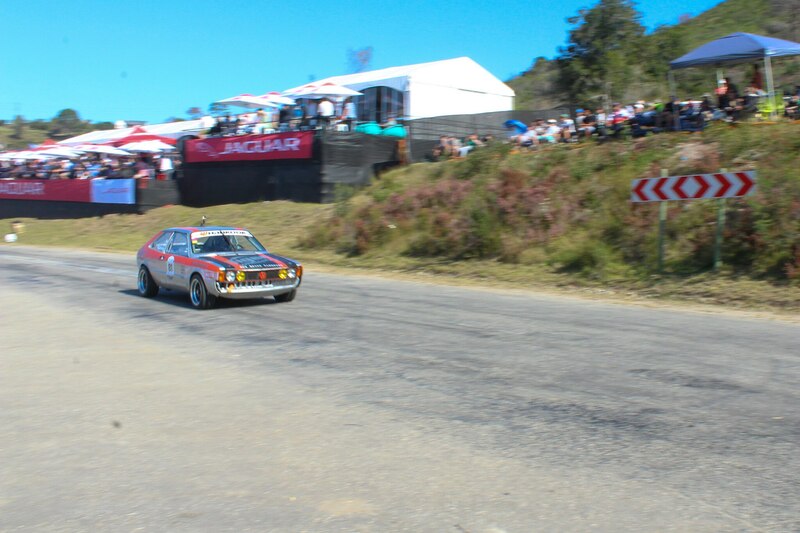 The Jaguar Simola Hillclimb is a family affair for many, and that includes Nico Janse van Rensburg, who championed his 1974 Volkswagen Scirocco alongside family members Julian and Janus, the former behind the wheel of a 2008 Golf Mk1 (Volkswagen produced the original Golf in South Africa through 2009 as the City Golf) and the latter piloting a Nissan Leaf RC. 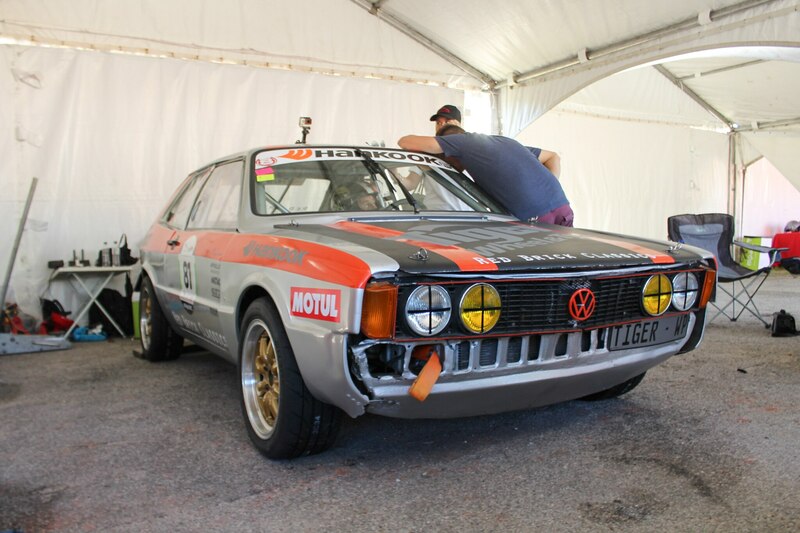 Nico’s silver-and-orange Scirocco’s best time would be 53.424 seconds. 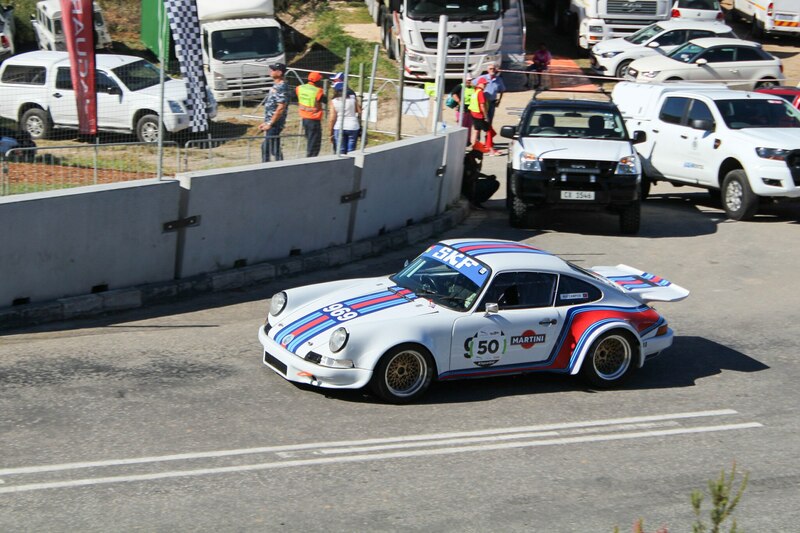 Rui Campos entered his Martini-liveried 1969 Porsche 911 RSR in the King of the Hill Competition as well as Classic Car Friday, giving him a full three days of racing. 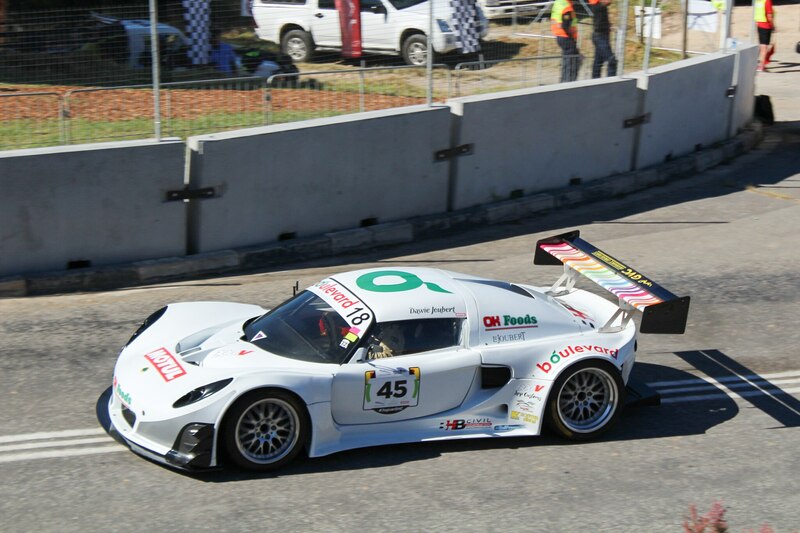 (Several other drivers, including the afromentioned Peter Lindenberg, as well as his daughter Paige and local legend Franco Scribante, entered both as well, but in different cars.) 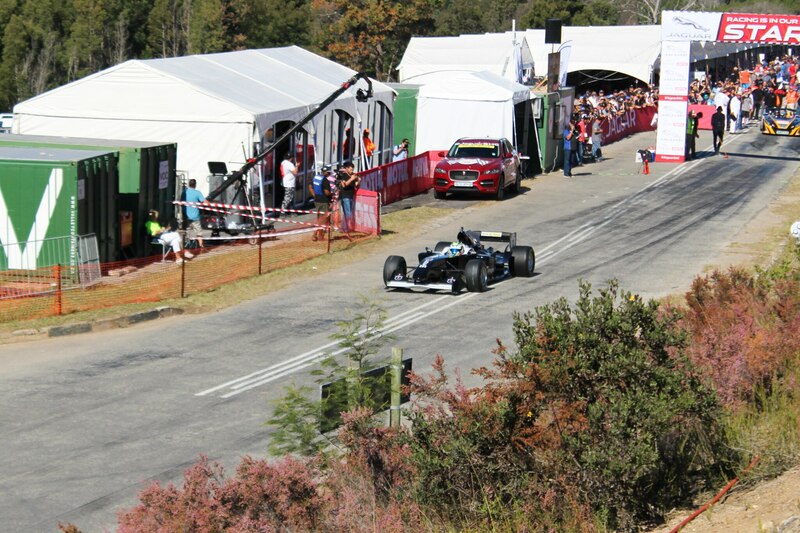 His best time up the hill was 48.222 seconds. 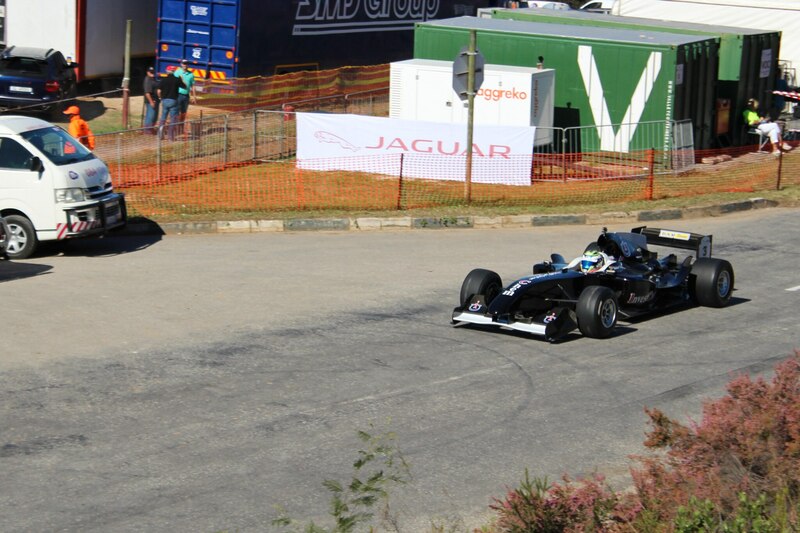 Some would say its madness to bring a low-slung Formula car that’s danger close to being an F1 racer to the rough pavement of Old Cape Road. 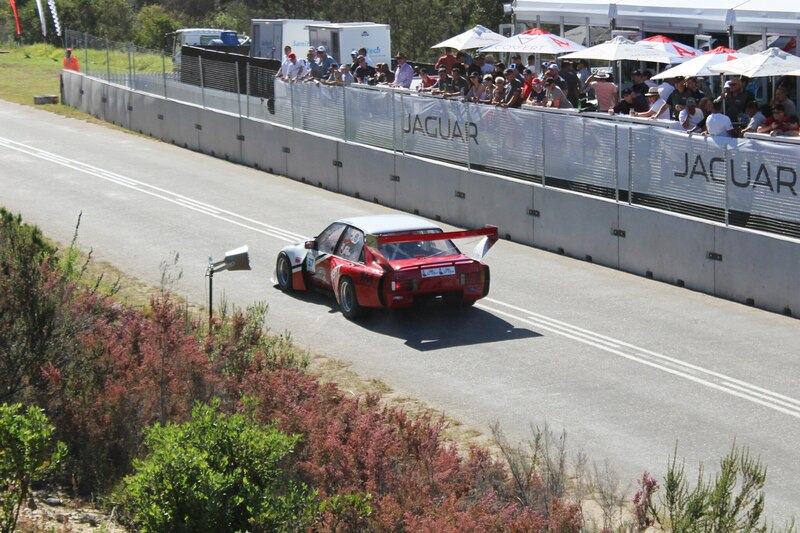 Those some need to reevaluate their petrolhead credentials, as Robert Wolk’s black A1 GP Ferrari treated the crowd to something damn close to the sound and fury of a proper caged demon-Tazing Formula 1 engine courtesy of its 4.5-liter V-8. 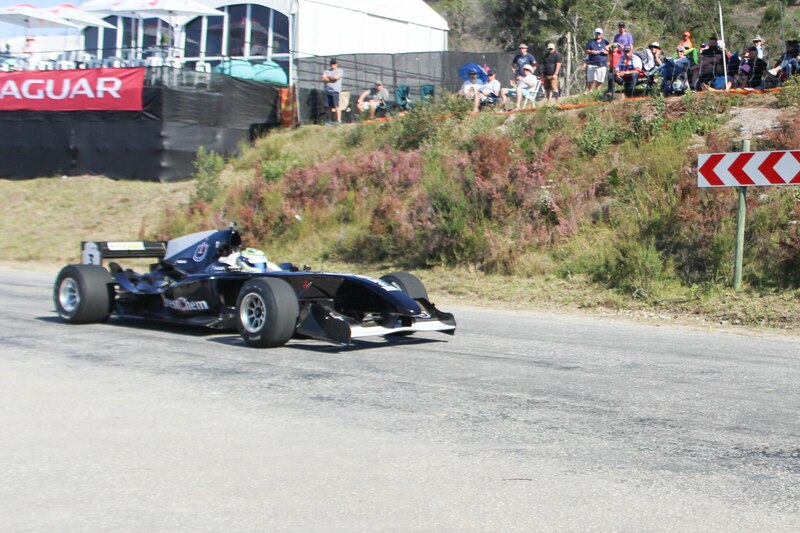 If only the F1 cars of today still sounded so good. 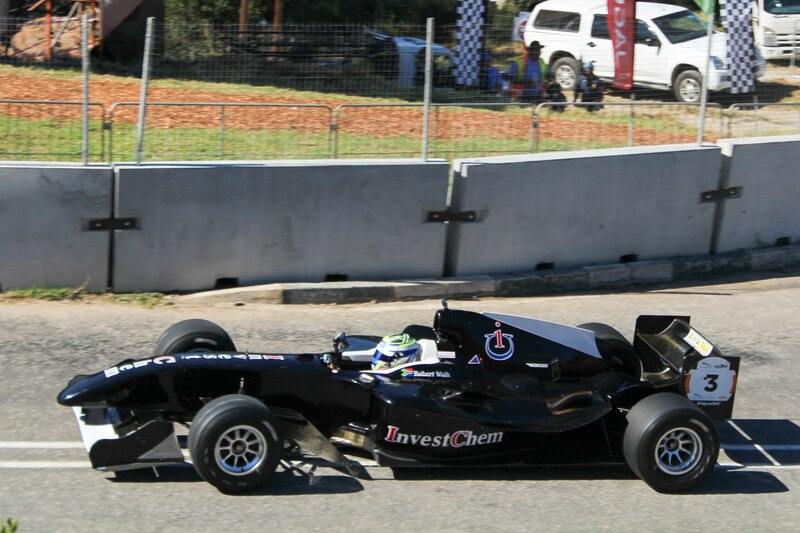 It took second in the Single Seater shootout with a time of 37.691 seconds. 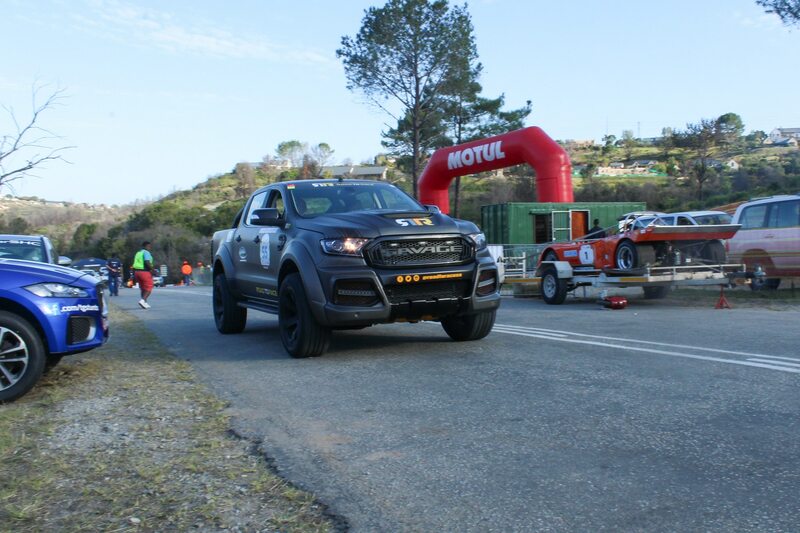 Willie Hepburn’s Opel took home the trophy for largest displacement courtesy of its 7.0-liter Chevrolet V-8, which is about 3.5 times the size of the largest four-cylinder to be fitted into the car by the factory. 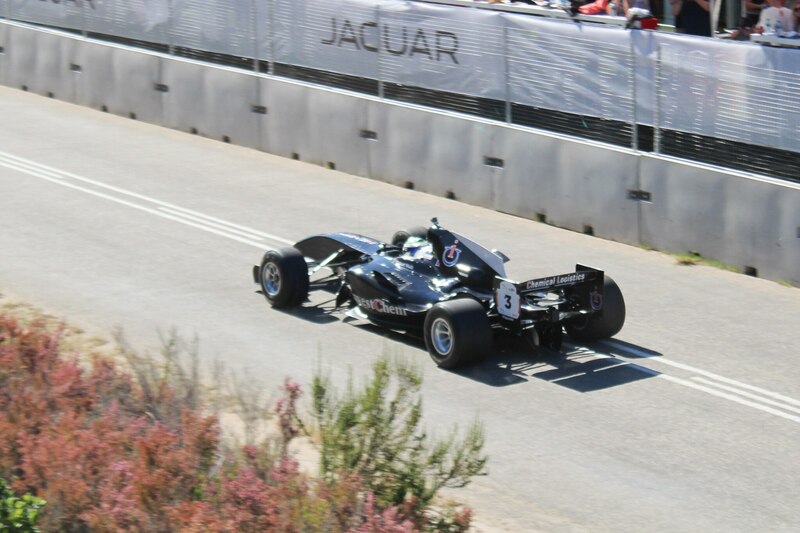 Little of the factory car, which was about the same size as a modern compact, is left, however, as it now wears custom racing bodywork. 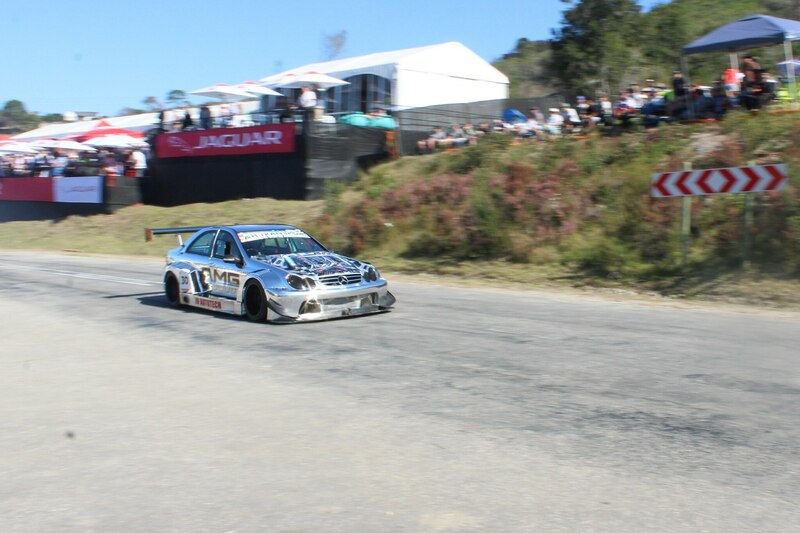 Its best time was 42.931 seconds. 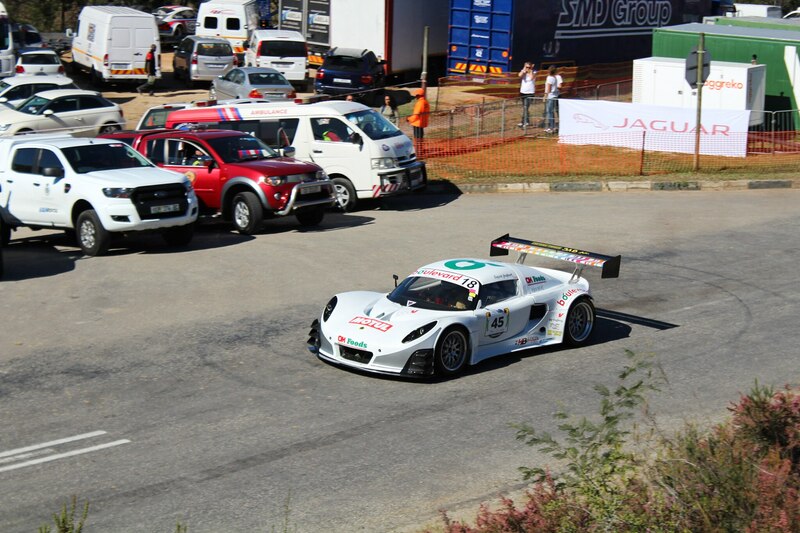 Like Hepburn’s Opel, Dawie Joubert’s Lotus stretched the definition of “modified” about as far as possible. 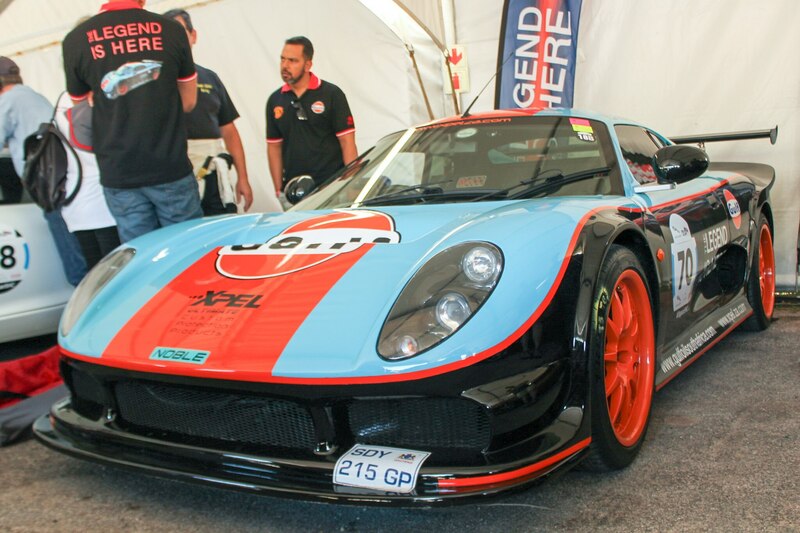 About the only bit of the original Lotus that remains is the badge, as the car features a tube-frame chassis and a 2.4-liter turbo-four race engine sourced from Honda mated to a sequential manual gearbox. 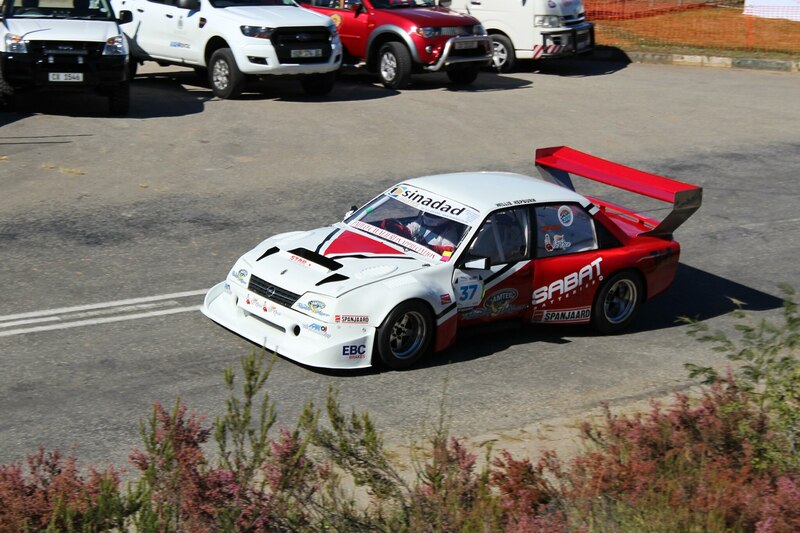 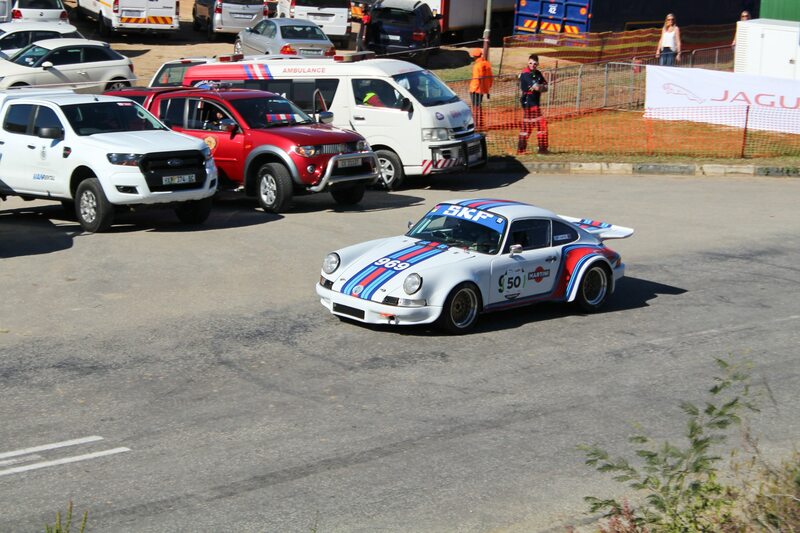 It finished third in the modified shootout with a time of 40.025 seconds.